Ever wondered how to nail your drives at the golf course? We were very lucky to be given the opportunity to have a little time with PGA Pro golf coach Kendle McCrossan at Wrag Barn who took our Digital Content Manager, Matt, through his paces and taught him the basics about perfecting his golf swing! Having never picked up a golf club in his life, Matt was excited to be getting some top-level coaching. If a complete novice like Matt can make progress, it's even better for improvers! Here are a few top tips for making sure you’re setting yourself up for success at the driving range. After just one session with Kendle, we’ve definitely been bitten by the golfing bug! The best thing to do when you’re starting out is to make sure you’ve got a very good grip to rely on. There are loads of videos on YouTube, but at Wrag Barn there are friendly coaches that are more than happy to help you out. Make sure the club is in the fingers of your hands, as opposed to the palms. Once the club is in the fingers of your hands, you are able to hinge your wrist while keeping your lead arm (arm closest to target at set up) comfortably straight. The next thing to look at is your ball position. 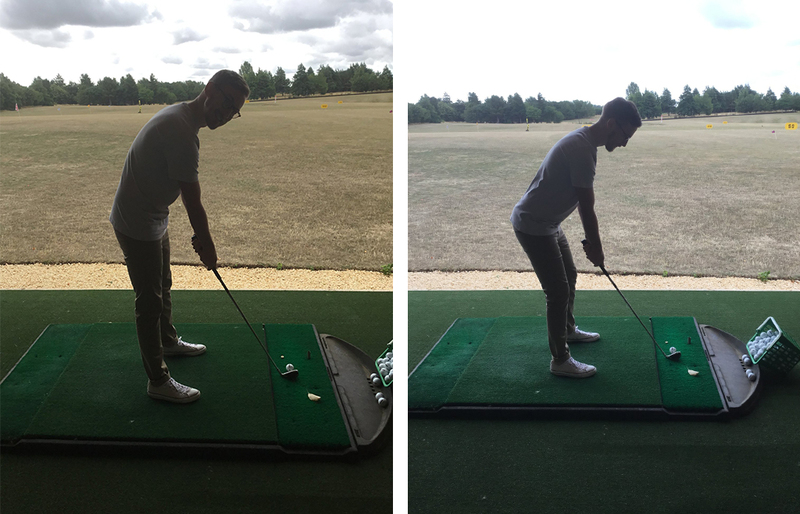 Once the ball position is in the middle of your stance with an iron, then the arch of your golf swing is going to be in the centre of your stance. As the club comes down to the middle of your stance, the club’s going to hit the ball first and the ball’s going to go up, using the loft of the club. With an Iron it should be in the middle, with a driver it should be more towards your left heel (if your right-handed), and anything from a 6 iron onwards, towards your driver, there’s going to be a slight regression to where your driver ball position is. Club alignment is very important. It’s just making sure the club is aligned with wherever you want the ball to go. It sounds very simple, but it’s so easy to miss that step. So a good tip to do that is to stand behind your ball, directly in line with your target. Pick a spot – a blade of grass or whatever you’d like to see – three to six feet in front of your ball, in line with the target itself and once you’ve aligned your club, then you can build your posture around it. It’s so important to set up with a good spine angle. Setting up with either a rounded spine angle that appears to look like the letter 'C', as Matt did at the beginning of our session, or, with an overextended lower back that will cause the spine to appear like the letter 'S', will have an impact on the golf swing and will also apply unnecessary tension on surrounding muscles. Setting up with a neutral spine angle will allow you to rotate effectively and will also reduce to risk or injury. It’s just making sure you set up in an effective way so you can go out and enjoy playing golf safely. There are four of us here at Wrag Barn that will be able to check that over with you. We look forward to seeing you soon!